So begins one of the best known songs of the American West, written and first played by Bob Wills and His Texas Playboys in 1938. A romantic tale of lost love, it has been recorded by many artists and is still a featured tune of Western swing bands today. This song refers to San Antonio, Texas, of course, but few Floridians know that their state had its own San Antón, a fortified mission and garrison built 450 years ago in the Calusa capital town located on today’s Mound Key.The full name was Fort San Antón de Carlos, because the Spaniards referred to the capital (and its king) as “Carlos,” not Calos or Caalus as it was more properly pronounced. 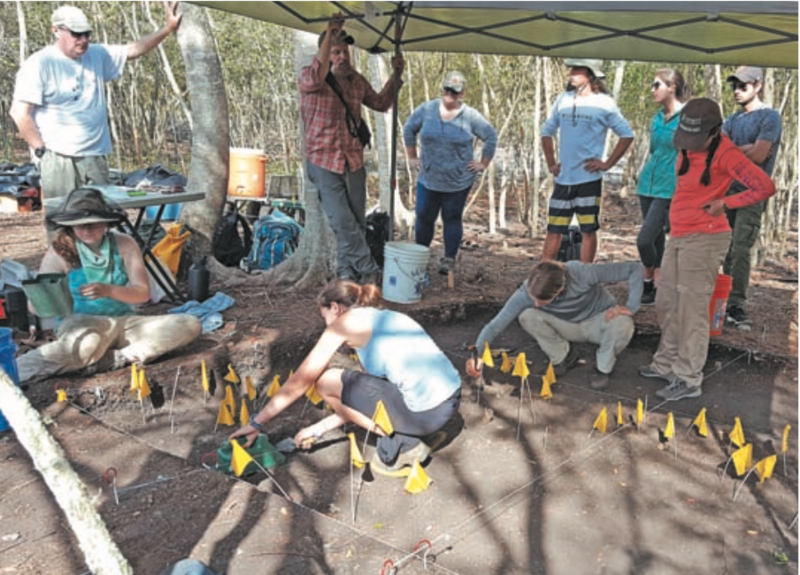 As reported in the March 2015 Friends of the RRC Newsletter, we had previously located both the king’s house (on Mound 1) and the much larger area of the Spanish fort and Jesuit mission (on Mound 2) using a combination of remote sensing, coring, and archaeological excavations. We returned to Mound Key May 8 through June 1, 2017 to explore what appeared from ground- penetrating radar (GPR) to be one or more linear structures.We thought these might be walls of the fortified mission, first built in the fall of 1566 and garrisoned with some 35 men early in 1567. Our suspicions were confirmed. We opened a 3-x-3-meter excavation on the highest flat elevation and another 2-x-2-meter square downslope, where GPR had indicated structures. No more than a foot beneath the surface, stains of posts were clearly visible in both excavations. 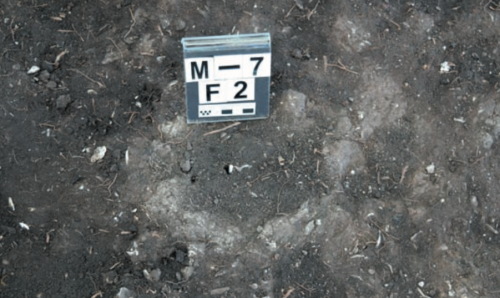 In many cases, these dark soil stains were surrounded by a crude tabby (a concrete made by burning oyster shells to create lime, then mixing this with water, sand, ash, and broken shells). Tabby is known from other early Spanish structures in the Carolinas and Florida, and it was later adopted by the English.The tabby walls at Mound Key are among the earliest known in the New World.We found only a few artifacts, principally Spanish ceramic sherds and beads, but that is not surprising because historic documents indicate that items of value were removed when the fort was abandoned in 1569. In spite of its brief occupation, San Antón de Carlos witnessed the tragic clash of two cultures that neither side could win.The Calusa refused to be converted and conquered, and the Spaniards refused to act as Calusa allies in their conflicts with other Native groups. Hostilities between Europeans and the Natives of South Florida became the rule rather than the exception throughout the region. King Caalus plotted to overthrow the Spaniards, but – betrayed by his cousin – he was killed by them. 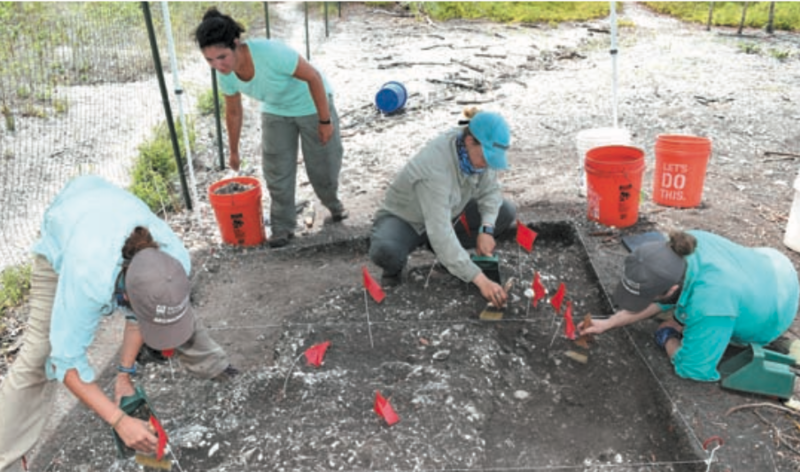 Hostilities intensified, to the point that early in 1568 Spanish forts at Tocobaga (modern-day Tampa Bay) and Tequesta (modern-day Miami) were abandoned.The remaining Spaniards from Tequesta were moved to a reinforced Fort San Antón in April, 1568. Upon the death of Caalus, his cousin Felipe became king. But Felipe was ultimately unable to walk the uneasy tightrope between Spanish demands and pressure from the Calusa nobles and met his end at the hands of the Spaniards in 1569. Following Felipe’s assassination, the Calusa abandoned their town. With no one left to convert or govern, and no one to provide them labor, the Spaniards dismantled the fort and left the island in June, 1569. We are again grateful to Tim, Ted, and Todd McGee for permission to use their dock and to excavate on their property. Field work was performed by University of Georgia archaeological field school students (Ian Berrigan, Kate Ganas, Rachael Horton, Hannah Iocovozzi, Nicole Oster, Sarah Refuss, and Sidney Reynolds) under the supervision of Professor Victor Thompson and graduate assistants Kat Napora and Isabelle Lulewicz.They were joined by Karen Walker and Bill Marquardt of the Florida Museum of Natural History/Randell Research Center. This work is supported by a collaborative research grant from the National Science Foundation. Worth, John E., editor and translator. (2014) Discovering Florida: First-Contact Narratives from Spanish Expeditions along the Lower Gulf Coast. University Press of Florida, Gainesville.